Time-Shift is an Eamon adventure written by Corey Sena. 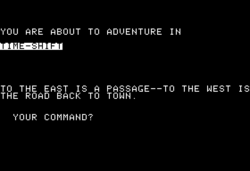 Time-Shift, the only adventure written by Sena, was released in March 1993. The adventure is very simple, with 27 rooms, and its title is irrelevant to its content. "You explore a small cave. Strangely, there is no time travel or other anomaly, as suggested by the title. Probably a good pick for young people." The adventure has no introductory text. The implied plot is that the adventurer has explored a cave and inadvertently sets off a cave-in, necessitating his or her finding an alternate means of escape. Despite the adventure's simplicity and brevity, Tom Zuchowski praised how the many "special items" found in Time-Shift were able to hold his attention and attributed his low rating of 4 of 10 primarily to the adventure's short length. This very feature, however, presumably led to his recommending Time-Shift to so-called "Young Eamonauts." Additionally, Zuchowski expressed some puzzlement of the absence of any time travel plot device in the adventure itself. The cave is set to the east of the Main Hall. As the cave is a short distance from the Main Hall, it is plausible that the cave is, like the Beginners Cave, one of the many set into Eamon Bluff. This page was last edited on 13 September 2018, at 20:24.